FULLY RECLINABLE WITH SLIDER. 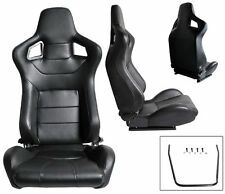 2 BLACK PVC LEATHER RACING SEAT W/ SLIDERS. These seats are designed for universal fit. PVC Leather- BLACK. 1 Pair (1 Right and 1 Left). 35 lbs EACH. These can be installed on e32 7 series and also a nice upgrade for the e34 5 series sedans like like 1989-1995 540i or M5 or 535i 530i 525i. What you see is what you’ll get, pair of rear seat headrests only. Nice Overall Condition. Shows Minor Wear. Model:(Don't use for interchange) M5. Part Type: Front Seat. All Warranty’s are non-transferable. All parts are tested and/or inspected before being entered into our inventory, unless otherwise stated. Make/Model/Engine: BMW / 525i/ m50. Used, in good condition. for more BMW parts. Year: 1995. FULLY RECLINABLE WITH SLIDER. CLOTH- BLACK RED STITCH. 2 BLACK / RED STITCH RACING SEAT. These seats are designed for universal fit. 34 lbs each seat. 2008 2010 BMW M5 (bucket). (leather). (electric). Air Bags & Seat Belts. All our parts are from Left Hand Drive (LHD) donor vehicles from the USA. Cash on pickup. Location: TOP SKU: BM111417-105. Exterior Color: ALPINWEISS 3 (300) ALPINE WHITE Interior Color: KLIMAVOLLLEDER/SEPANG BRONZE. BMW Right Front Passengers Seat Wiring Harness E32 E34. This is a used Original BMW part. There are no cuts. All wiring harness connectors are intact. Right Front Seat Wiring Harness. Quality New and Used BMW Parts. Fits all Bmw E28, E23. These are used original BMW parts. I also have other BMW parts, feel free to ask. New BMW Seat Trim Panel. PASSENGER SIDE. Sedan F02 ALPINA 2011-2012. Sedan F02 750Li 2009-2012. Sedan F01 ALPINA B7 2011-2012. Sedan F02 760Li 2010-2012. Sedan F01 750iX 2010-2012. Sedan F02 750LiX 2010-2012. Sedan F02 ALPINA B7L 2011-2012. Sedan F01 750i 2009-2012. 5' E61 LCI. 5' E60 LCI. VERY MINOR WEAR ON LEATHER AS SHOWN. WORKS FOR EITHER LEFT OR RIGHT FRONT SEATS. BMW Rear Child Seats Hardware E46 E36 E34 E39 E38 E32 E31 Z3. These are used Original BMW parts. These are most of the fasteners needed to mount rear child seats in certain cars built 1993-2006. Details can be viewed in the photos. Light silver gray / Silbegrau-hell leathers/skins - Nappa leather. (So I have a complete set of front seat skins, except for the 2x Upper port side bolster skins.). 2x Headrest skins. 2x Upper Port side bolster foam. USED BMW E34 PASSENGER SIDE ELECTRIC SEAT CABLE HARNESS, FOR VEHICLES WITH HEATED SEATS. REMOVED IN PERFECTLY WORKING CONDITION FROM A RUNNING 1991 525i. HARNESS IS IN VERY GOOD SHAPE; NO FRAYED CABLES, NO BROKEN CONNECTORS.